Following on from the sell–out success of last year’s inaugural event, the second South Coast Jazz Festival opens with a launch party on Thursday 21st January 2016 with local trumpet player Jack Kendon and his quintet (featuring vocalist Imogen Ryall) sharing the bill with Alex Garnett and his ‘Bunch of Five’. As preparation and anticipation hots up, Co-Curator Claire Martin OBE talks about the festival, her forthcoming projects and how she balances it all with her family life on the south coast. No one could have foreseen the amazing success that was last year’s South Coast Jazz festival. How do you hope to build on that this year? “My hopes are for an equally great turn out of music lovers! People came from far and wide for the first festival - some from as far away as Wales and Manchester, so that was very encouraging. My long-term goal is for the festival to become an established feature of the ‘jazz calendar’ and become something that people can look forward to every year as a major jazz event on the south coast. Tell us why you chose these particular acts this year and why they are special? “This year we have a singer every night. Imogen Ryall, Christine Tobin and Norma Winstone are all very special vocalists that I admire and so it made sense to include them - of course I’m a bit biased being a singer myself, but each has their own individual style and will be offering their own take on what ‘jazz singing’ is all about. Anita Wardell is doing a ‘jazz vocal workout’ which will be brilliant. Pianist Gareth Williams will be doing a masterclass and presenting his tribute to Bill Evans and Scott LeFaro with bassist Dave Green. Arun Ghosh is a clarinettist that has really caught my eye over the last couple of years. He’s such a talented player and writer and he will be making his debut here on the south coast and will showcase some brand new material. He really puts on a show and I’m sure that the Ropetackle audience will be thrilled by his infectious and engaging music. Pianist Nikki Iles will bring her band ‘The Printmakers’ which, as well as including Norma Winstone, has some great jazz names involved; saxophonist Mark Lockhart and guitarist Mike Walker are both giants in their field. The charismatic saxophonist Alex Garnett will bring his ‘Bunch Of Five’ band down for the opening launch night and I’m sure he’ll be sharing his very funny anecdotes as well as delivering some world-class jazz. Do you see the SCJF stretching across other venues or are you happy with its current format? “At the moment as we are at such an early stage of getting this festival firmly placed on the jazz map, I’m happy for it to stay in one venue. There would be too much organisation involved for us to spread this out as yet. As both Julian and I are gigging musicians and as such have to juggle lots of other jobs, this size is perfect for us. Having said that it would be good to have some Brighton gigs as well as the venue in Shoreham. Watch this space!! ​What do you like about the Ropetackle Arts Centre? “I love EVERYTHING about the Ropetackle. The energy and commitment of the staff, the great location (you could almost be in New York. Come along, you’ll see what I mean), the tremendous support from the management team, the loyal music fans that regularly attend events, the lovely food and the relaxed atmosphere. The opening night will be quite an event, what’s on the agenda? What else is on the programme? Apart from the festival, what other projects are you working on at the moment? “I’m very pleased to be part of drummer Matt Skelton’s ‘Hollywood Romance’ project. I get to sing with the Tippet Quartet and pianist James Pearson. It’s lovely to be asked to sing with an ensemble that is already fully formed rather than putting it together myself. I am also very much involved with my new group with singer/saxophonist Ray Gelato. We have just recorded our duets CD for Linn records and we will be touring with this throughout 2016. This year will also be my sixteenth anniversary as a Radio 3 broadcaster on ‘Jazz Line Up’. It’s a very important part of my life and I absolutely love it. “Moving to Brighton 21 years ago was without doubt the BEST thing I ever did. I love it with every fibre of my being. It suits me. I love the space, the people, the politics and it’s the most amazing place to bring up children. You’re a busy mum too. Any tips on how you fit it all in? “As for any working mum, it’s all about organisation. I’m time obsessed (sadly) and have things running like a military drill most of the time. I have a very good relationship with my daughter’s father and I’m not on tour for more than a few days at a time. I usually turn down anything longer than two weeks. How does your average weekly schedule shape up? “It’s hard to have an average week as a musician, as every week/month is different, as is the pay packet. It’s not for wimps. I do a couple of gigs a week. If I’m doing Jazz Line Up then I also have to set aside time for listening and scripting the shows. I go to the gym 2 or 3 times a week and I drive my daughter to basketball training and games two to three times a week as well. There’s far too much travel for my liking with my job! It’s agony leaving at 10am for a Friday gig out of town to arrive at 6pm and then do the gig! That’s how it is nowadays on the UK roads sadly. Have you got the balance right between your career in music and a settled family life? 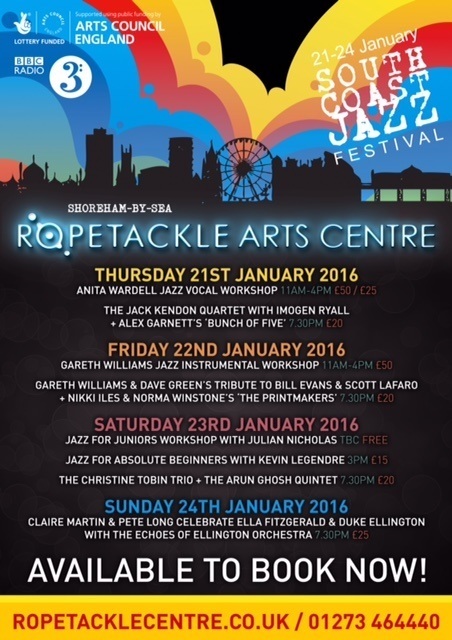 Sun 24th January 2016 at The Ropetackle Arts Centre, Shoreham–by-Sea, West Sussex.